These two ladies do have one thing in common: They totally steal every scene they're in! But here's what happened during Monday's 2014 Emmy Awards: The Los Angeles Times Accidentally mixed up Parks and Recreation star Retta and Orange Is the New Black actress Danielle Brooks in their red carpet arrivals gallery. After fans and the two actresses noticed, the newspaper quickly fixed the error and later offered their sincere apologies. 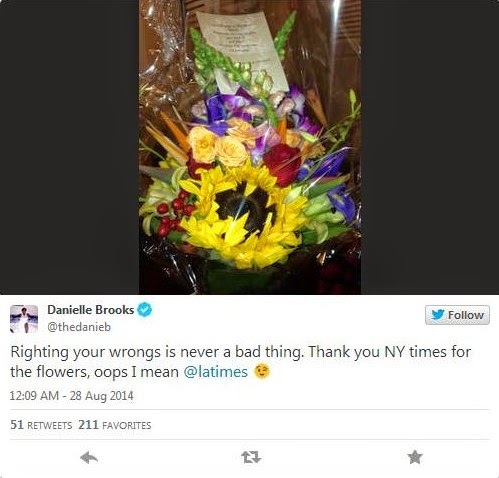 "Righting your wrongs is never a bad thing," Brooks wrote on Twitter with a picture of flowers from the publication. "Thank you NY times for the flowers, oops I mean @latimes"
Funny and classy—exactly what we expected from the star. The fan favorites first learned of the newspaper's mistake on Emmys night. 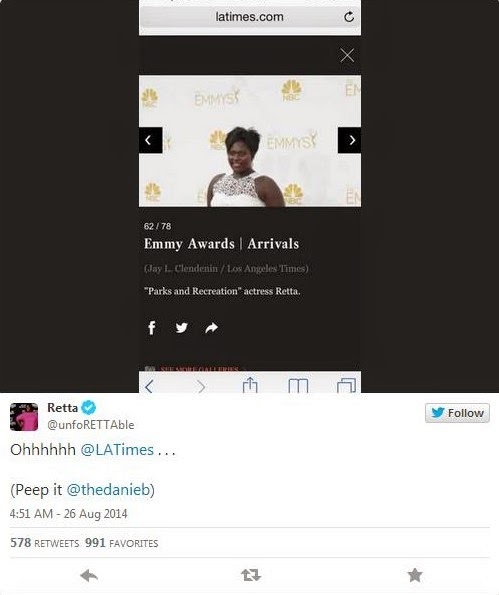 "Ohhhhh @LATimes…" Retta Tweeted with a screen grab of the mistake. "Peep it @Thedanieb"
Brooks reportedly responded, "Oohh child! I guess all chocolate girls look alike. We all look a lot." The Tweet has since been deleted. Both stars, however, appear to have moved on from being victims of mistaken identity. "I love my girl @unfoRETTAble but we both work too hard for Hollywood to just mix us up," Brooks wrote on Twitter. It's safe to say this mistake will never happen again.